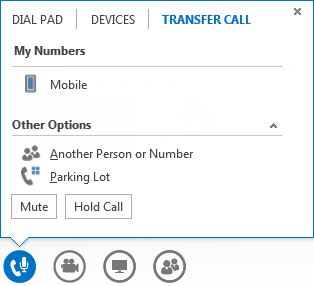 You can transfer a Lync call to another person or number. For example, if you need someone else to handle the call, you can transfer to them. Or if you need to leave your office, but want to continue your conversation, you can transfer the call to your cell phone. Point to the phone/mic icon in the call window. Under My Numbers, click one of your numbers, such as your mobile phone, (these are the numbers that were added to your Lync account). Under Other Options, click Another Person or Number. Then select a person, or type a number in the bar, and click OK.